I have been living outside my hometown for last seven years. In between there was a small stint of 18 months but I am out otherwise. And in this period, living away from home, apart from getting all the lectures about taking care, making good friends and no bad habits; recently I have started receiving more important instruction by my parents- I have to call them regularly and they should not be the only one who calls me. There should be a two way communication always. This came as a surprise to me as when I was in college, things were fine. In those 4 years, I never heard anything of this sort. They never asked me to call them. I took it as their coolness and considered myself lucky to have such chilled out parents. In due course, I realized it was never about the “coolness” and “chilled out” and they never really needed to say all this. My father kept such a stringent check on my studies that he used to call me almost every day and be aware about what’s happening and making sure I am not losing my way. Also, he also did not want me to spend my mobile balance uselessly when he can call. Moving out in a job, things changed drastically. Their expectations from me, both in emotional sense and monetary contribution in the family, increased. About the latter, I wasn’t much concerned but for the emotional part, sometimes it used to me freak me out. I had only one question which I could, obviously, never ask them- what’s the need of talking every day? Or how does it matter that they are calling me and I did not? Thinking about it later, I realized it’s all about keeping pace with the world. And parents of people of my age are too old to walk that fast, abreast with the next generation so that the gap doesn’t arise. 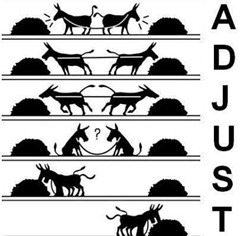 Few of them make the adjustments well, majority can’t. When I go home for 2-3 days in some holidays, my mother does not want me to leave the house and I want to catch up with my friends. She says sit with me and talk, tell me things. I am not that good a speaker or story teller and I talk sense rarely; so I try to avoid them. In between, I forgot her desire, her love for me. It’s sad actually how much I miss her when I don’t get breakfast on time. Then I want her to be with me. Bad people, we are. I have thought many times- should I shout at them? Will it fetch results? Will it make them understand that world is moving fast and they need to catch up with the trends. Luckily I gave a thought before all this and I think I have found an answer. It’s all about evolution- how you evolve as a parent and guardian as the world progresses. Thinking myself after 30 years, when I will be my parents’ age and my kids will equal mine; do I see them doing all this- out with friends, coming late and not talking to me? Sure, I do. This will happen. I will be extremely lucky if it does not happen and will have to be extremely patient if it does. For me, now I believe it’s too late to change myself. I do try calling them whenever possible but in this regard, I will never exceed their expectations. The only good thing in this- I will never ask them the question that popped in my mind which I have mentioned above. It will do no good. When I know I can’t change for them; why should I expect them to change for me, at an age when they have given almost everything? It will be way too unfair. I only hope I adjust myself pretty well, evolve in the right way and make myself aligned to the world in the days when time will be ever more precious than the money.